Good old-fashioned winter. -5 degrees this morning. 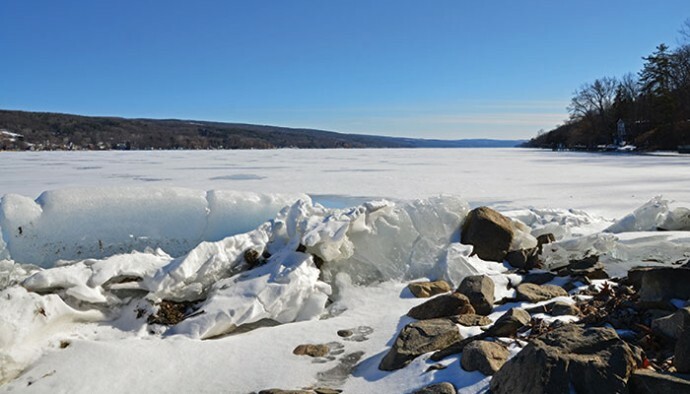 All of Keuka Lake is frozen except a small section, 1 mile north of Hammondsport. In many ways, 2014 was a typical year for natural history events, but weather events were anything-but-typical here in the Finger Lakes. It’s been said that 90 percent of us couldn’t start a conversation if it weren’t for unusual weather. Well in 2014, Mother Nature’s rampages got a lot of folks talking! 2 degrees this morning and 7 inches of new snow. -6 degrees overnight. Nine turkey at the feeder. One had a band on its leg, #3637. It was banded on my property last year by the DEC as part of a hen dispersal study. 40 degrees and rain yesterday, snow melted. 6 degrees and 25 mph winds this morning. More than 60 Tundra swans on Keuka Lake. -5 degrees with a high of 6 degrees. Snowy owls have migrated south into the Finger Lakes again this winter. I watched one take flight from a fence post west of Seneca Lake, scattering hundreds of snow buntings and horned larks. Snowy owls are still being reported west of Seneca and on Keuka Lake, near Branchport. Haven’t had a winter like this in years. Despite the frigid conditions, ice fishermen and ice boaters are taking advantage of the hard water. A recent Cornell study determined that chickadees take and eat up to 50 sunflower seeds per day at bird feeders. Eating that many seeds is like an average person eating 100 lbs. of hamburger a day. Chickadees are constantly coming and going, burning up loads of energy. 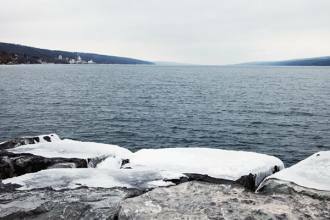 All of the Finger Lakes except Seneca, Cayuga and a small portion of Keuka, near Hammondsport, are frozen. I spotted a white-winged scoter and a female long-tailed duck (formerly named oldsquaw) near permanent docks where bubblers keep the water open. including three gobblers on full display. When a red fox came from the woods, the gobblers herded the flock into a circle. Seemingly trying to impress the hens, four jakes (young males) walked toward the fox in unison. The fox slowly retreated into the woods. 60 degrees. Turkey vultures have returned from the south. First day of spring. 40 degrees. Ice fishermen have been doing well jigging for lake trout on Keuka and Canandaigua Lakes. After scattering birds at my feeder, a sharp-shinned hawk perched nearby. Deep in the adjacent rhododendron, a chickadee boldly squawked at the hawk. The sharpie had enough; it flew into the shrub and came out with the chickadee in its talons. Watched a gobbler mate with a hen today. The ritual took two minutes and the hen – appearing to be glad it was over – began feeding. The tom puffed into full display, strutting about and rather full of himself. gobbled in front of the hens. Canandaigua Lake is still frozen, there was a good spawning run of rainbow trout into Naples Creek. I watched anglers catch 10 trout in less than an hour. 56 degrees. Some of the ice has melted on Keuka, however large ice sheets, 6 to 8 inches thick, are shifting dangerously east and west across the lake. Ice has now melted on most of the lake. However, a 5-mile-long sheet of ice left a path of destruction as strong winds pushed it east and west into the shoreline, before moving north and breaking apart. Seasonal and permanent docks, boats and hoists were crushed. A red fox den near our home once again has a family of six pups. I watched and photographed them for an hour as they pounced on each other, played tug-of-war by pulling tails and chased after anything that moved (insects and blowing leaves). Caught 42 perch today. One was 13 inches. Females are still hard with eggs and haven’t started spawning. 71 degrees. Loons are in close to shore, feeding on spawning perch. Warblers are migrating through. Mother Nature has been on a rampage. It started with a harsh winter, followed by damaging ice. And now, heavy downpours wreaked havoc. It was a hot and humid 87 degrees, followed by a horrendous storm overnight. Between 5 and 9 inches of rain fell in a short period of time, washing out roads and bridges and damaging homes, docks, boat hoists and property from the Guyanoga Valley, Branchport, and into Penn Yan. More rain. The lake is brown and full of debris from the flooding. The flooding has no doubt impacted ground nesting birds such as turkey in the forest and loons on the shore. I saw a family of geese earlier with 12 goslings, now reduced to four. Pouring rain again. Carp spawning near shore. Everything is lush. I can’t recall ever seeing so many shades of green on the landscape. Raccoon raided the nest box near the house and took six baby chickadees. The confused adults keep coming to the box with food attempting to feed their nestlings. Fawn in the yard running in circles, stumbling and repeating the exercise as the doe looked on. Chickadees rebuilding the nest destroyed by raccoons. Osprey flew along the shore with perch in its talons. There are several nests nearby. Chickadees incubating six eggs in the nest box. One year ago, my neighbors spotted two bucks swimming in the lake. This morning, another buck was swimming in the lake in front of their house. Extreme weather continues. A microburst toppled large trees near Keuka College. To the south and west, hail the size of quarters accumulated 2 inches and shredded leaves on trees and grapevines. My neighbor, who is quite reputable, spotted a black bear cub crossing the road, 1 mile north of our house. Quite a few broods of common merganser on the lake. Although typical clutch size ranges from 6 to 16, sometimes broods join together. Saw one female with 33 chicks in tow. I’ve been watching three wood duck broods substantially reduced by predators – large fish, eagles, osprey, owls, raccoons or fox. One brood started with 13 and is now down to five. Kind of like a rain forest around here. Humid, daily downpours and lush with mosquitoes. With so few bats around, I’m hoping the emerging dragonflies will reduce their numbers. Softshell turtles are laying eggs in the sandy, gravelly shoreline. Another quick downpour, some localized flooding. Three bats in the evening sky, the most I’ve seen in quite some time. Caught a 10-inch rock bass. When I removed the hook, it regurgitated a 4-inch shrew. Trail cam captured a photo of a red fox pup out back this morning. Because of all the rain, mushrooms are popping up all over. Horseflies are numerous and relentless. Spots on fawns are giving way to winter coats. For the past three summers, I have not heard the flute-like song of a wood thrush. When we moved here in 2000, we often heard their enchanting song from deep in the woods. Possibilities for their decline here and elsewhere include forest fragmentation and cowbird parasitism. Hot and humid. Hummingbirds still taking nectar from the flowers on our deck. Soon they will be migrating to the tropics. Quite pleasant this month, warm and calm with the colors of autumn coming on slowly. I’m seeing a few more monarch butterflies in migration than I saw last year. The screech owls are calling out back most evenings. Abundant crop of both red and white oak acorns. With so many underfoot, it’s hard to keep your balance. Temperatures are around 80 degrees. Very nice color. With the wind this afternoon, bass have been close to shore feeding on crayfish that are washed from under rocks. Caught one nearly 5-lb. largemouth bass and a 3-lb. smallmouth bass. Planted the last of nearly 2000 garlic cloves in the neighborhood gardens. Helps to keep the vampires away. Nothing close to a killing frost. Garden continues to produce, but my tomatoes have been killed by the blight. Trail cam report: four bucks – one 10-point, two 4-points and one spike. Snow. Rut is in full swing, bucks chasing does in the woods. First killing frost and 1 inch of snow. A very quiet opening day of deer season, 22 degrees. Just heard that south of Buffalo they had 60 inches of snow yesterday with 15 to 20 inches more predicted for tonight. It was 13 degrees here today with strong winds, but I’m not complaining. 11 inches of snow, cold and windy. Now I’m complaining. With the cold winds, hooded mergansers, buffleheads, coots and tundra swans arrived. 67 degrees yesterday, 55 degrees today. Now I’ve stopped complaining. Every fall, golden crowned kinglets migrate through and glean insects and larvae from the twigs on our Japanese maple. Four kinglets were in the tree this morning. A sharp-shinned hawk captured a blue jay at the feeder. It flew off with the jay in its talons, landed in the driveway and started plucking the screaming jay apart. Although quite a feat for a small hawk, nature is relentless and unforgiving. 4 inches of new snow. I am somewhat surprised to see a chipmunk still coming out of its den near the feeder and stuffing its cheeks full of sunflower seeds to be cached. Mild, mid-40 degrees. Photographed a young red-tail hawk that was feeding on a road-killed deer carcass that I placed out back. It was probably starving because I approached within 20 yards, and it refused to abandon an easy meal. Very mild and the snow is gone. Two mature bald eagles in a treetop near the canal at the north end of Seneca Lake. Their mating season is about to start. No white Christmas. It’s raining and 47 degrees. everywhere in the new fallen snow.